Rapidsoft Systems' Infrastructure Management and Remote Support (IMRS) business unit offers a comprehensive portfolio of System Integration Services (SIS), Infrastructure Management Services (IMS) and Remote Support Services (RSS) focused at improving IT operational efficiency and availability. The main aim of the IMRS is to enable organizations to focus on their core business instead of spending internal resources on non-core activities. 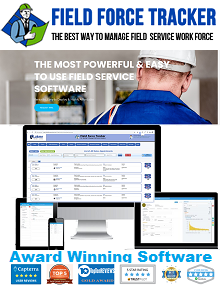 Rapidsoft System's IMRS provides compelling value and substantial cost efficiencies via a combination of world class processes and technology. Reducing operational cost of IT infrastructure is always a challenge. IT systems are at the center of modern business so IT organizations must take care of survivability and operational efficiency of its IT resources. Only option to achieve both these goals simultaneously is to outsource portion of unnecessary work to an organization that can take care of routine maintenance of your system. At Rapidsoft Systems, we simplify network and systems management by efficiently monitoring and managing performance and availability across your entire IT spectrum. Our infrastructure management service is aligned to the ITIL framework, delivering predictable and measurable benefits to our clients. Rapidsoft Systems Infrastructure Management Services (IMS) leverages our engineering team's deep expertise in system design, operational management and networking of over 25 years. We offer all the benefits of managed services coupled with reduction in operational cost of IT Infrastructure support, faster issue resolution time and access to top-notch talent on round-the-clock basis. At Rapidsoft Systems, we have developed an industry leading suite of Systems Integration services focused on design, implementation, and integration for both your Application and Infrastructure environments. Our IMS teams sole focus is on optimizing IT infrastructure and achieve operational cost reduction without compromising reliability of the infrastructure. To achieve this, we have developed significant expertise through years of supporting the most complex environments for companies across the globe. As a technology focuses company with R&D culture, we continuously keep tab on emerging technologies, and maintain direct working relationships with the world’s leading equipment vendors. We can help your business to meet the challenges of changing technology landscape, and more rapidly realize return on investment for applications and infrastructure technologies. Enterprises can achieve cost efficiencies and accelerated time-to-delivery by leveraging Rapidsoft System’s robust global delivery model, proven methodologies, standardized tools and mature processes for enterprise infrastructure management services (IMS). Rapidsoft Systems offers focused solutions in core infrastructure areas and leverages its proven IT infrastructure assessment tool and methodologies to design solutions that are closely aligned to the client's business strategy. Our comprehensive, industry-leading portfolio of infrastructure management services guarantees high reliability, round-the-clock availability, remote manageability, and optimum scalability. Our domain expertise spans diverse set of systems and technologies. Client’s can leverage Rapidsoft Systems’ offshore service delivery centers to avail proactive and cost-effective solutions and gain quick return on IT infrastructure investments. 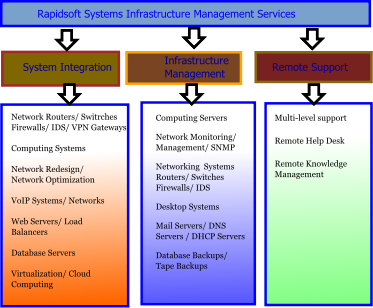 Rapidsoft Systems designs an IT and Network architecture serving your current and future needs as your business grows. 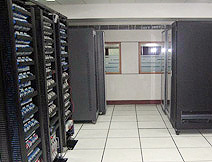 We will integrate all kind of equipment - networking gear, routers, switches, wireless base stations, telecom switches etc. We can create solutions around cloud computing and virtualization technologies. Rapidsoft Systems ensures that your IT infrastructure solution mirrors your company's business goals and objectives. These services include monitoring your critical resources and making them available to your business. The service components include matrix for Availability, Utilization, Performance and Configuration of Application servers, ensuring proper configuration of Network and Security Devices and management of your critical system Databases. Improved ROI and reduced TCO through standardization and more efficient operations. 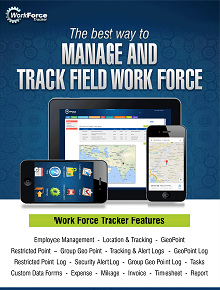 Reduction in risks through guaranteed service levels, reduction of incidents, predictive cost model, minimized staff turnover impact. Access to Microsoft tools, technologies and maturity models to assess current state. Improved support and end-user experience. Flexible pricing models and SLAs that accommodate dynamic business needs. Increased transparency to ensure effective control of IT budget. Increased scalability to support growth in core business.